The VisionTek PRO USB 3.0 SSD allows you to store and transfer your files between any USB 3.0 devices easily. With 512GB of storage, you have plenty of space for movies, music, photos, presentations and backups. 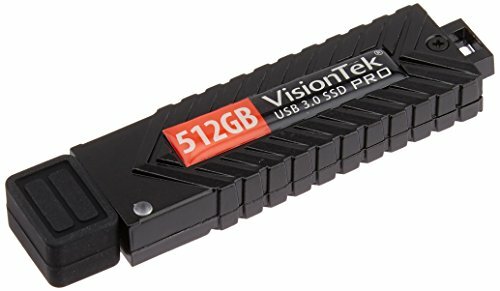 With its USB 3.0 interface, the Visiontek PRO SSD can transfer files up to 20 times faster than typical USB 2.0 flash drives (USB 2.0. Read/Write speed will be lower and device compatibility varies). The durable aircraft grade aluminum enclosure means you don’t have to worry about it breaking when you toss it in your bag. The VisionTek PRO USB 3.0 SSD is also perfect for expanding the storage capabilities of popular Ultrabooks including Microsoft, Dell, and Mac systems. The VisionTek PRO SSD allows you to expand upon the limitations of your Ultrabook and provides the ease of a portable storage upgrade without limiting performance.